"Jimi Hendrix Experience - DVD with Bonus DVD"
Item specifics - DVDs Format: DVD Edition: Full Screen Leading Role: Jimi Hendrix Rating: NR Release Date: Jan 23, 2001 Genre: Concert & Music UPC: 044005319491 Condition: Brand New Detailed item info Movie description Jimi Hendrix is arguably (though some loyal fans might say that word is unnecessary) the most talented rock guitarist who ever lived. His songs captured the revolutionary spirit of the 1960's and his onstage presence was dynamic and volatile. Though he died of a drug related incident in 1970, his popularity has never waned, and it seems his legions of fans will never get enough Hendrix action. EXPERIENCE was produced in 1968 and includes a plethora of gems -- from interviews with Hendrix and his two bandmates to a gorgeous twelve string acoustic performance of "Hear My Train A Comin." In addition, the video includes several previously unreleased performances and music videos, including the original promotional film for his early hit "Hey Joe." Credits Cast: Jimi Hendrix Notes DVD Features: Audio: Mono & Stereo - English This is the Deluxe Rare Limited Edition Collectors DVD with the special attached extra DVD that was only available through Best Buy during the 1st week of this titles release and has State of the Art digitially remastering. Tremendously rare now and a true collectors package. One of the only remaining and gone forever. Don't Miss Out. Step into the world of the Jimi Hendrix Experience. Filmed in London, Experience features live performances & rare interview footage. Highlights include Jimi's Unforgettable acoustic rendition of "Hear My Train A Comin'" as well as incendiary live versions of "Purple Have" and "Wild Thing" Filmed on Blackpool England. Narrated by Alexis Korner, this acclaimed program blens a high speed mix of commentary, interviews with Jimi, Mitch Mitchell & Noel Redding, and a soundtrack filled with such Hendric Classics as "Voodoo Chile", "If Six Was Nine", Castles Made Of Sand", "May This Be Love" and Foxey Lady. Coupled with Experience are more then forty minutes old rare or previously unreleased bonus material. Which include: 1. Popside, Stockholm, Swenden May 24, 1967 never before released live performances of "The Wind Cries Mary" & "Purple Haze" filmed for SVT Swedish Television. 2. Number Nine, Stockholm, Sweden January 9, 1969 Previously Unleased live performances of Jimi's blues masterpiece "Red House" as well as velocity redition of Cream's "Sunshine of Your Love". This rare footage. recorded for SVT Swedish Television, features Jimi playing as Gibson SG rather then his trademark Fender Stratocaster. 3. Olympia, Paris October 9, 1967 Jimi & the Experience present an unforgettable live version of "Wild Thing". 4. "Hey Joe" Original Promotional Film View the original promotional clip made in London's famed Saville Theatre in January 1967 for "Hey Joe". 5. "Dolly Dagger" Check out the acclaimed 1997 music video featuring Fawn Reed & James Hong. 6.The Bonus DVD Sampler of The Hendrix Experience only attached to this limited edition. MUDDY WATERS - FOLK SINGER - Classic 24/96 DAD. - Revolutionary Digital Audio Product that plays on a home DVD Video Player. Rare 1st edition out of print masterpiece. Out of print and one of the last existing in the world. OUR LAST COPY FOREVER. The most talked about "true audiophile" blues recording finally received the Classic vinyl treatment. Captured from the original 1964 Chess Analog Master Tapes, this is an intimate and spooky studio production. FOLK SINGER is a heralded recording from the King of the Delta Blues equally for its sonic qualities as for its content. Originally released on Chess in 1964, this title has repeatedly surfaced on Audiophile's Top 20 Lists for its superior sound, (this Pressing is unquestionably the best ever) Rare for most true pre-80's Blues recordings. FOLK SINGER represents a departure from the electric urban Blues sound that Muddy Waters pioneered. It is an all acoustic collection of recordings that illustrates his deep rooted rural Blues influences reminiscent of the recordings he made nearly 25 years prior in Mississippi. 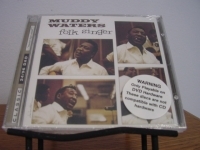 This release features Muddy Waters on Vocals and Guitar supported by the great Buddy Guy on Guitar, Blues Legend, Willie Dixon on Bass, and Clifton James on occasional Drums. Tracks include MY HOME IS IN THE DELTA - LONG DISTANCE - GOOD MORNING LITTLE SCHOOL GIRL - COLD WEATHER BLUES - BIG LEG WOMAN and much more. The Classic 24/96 Digital Audio Disc DAD is designed to be an audiophile musical reference. The process starts with the encoding of an analog signal from a live microphone feed or more commonly from an analog master tape. The highly sophisticated Analog to Digital converter (A to D) samples the analog signal 96,000 times per second (96kHz) and assigns a numerical value to each sample point.. the 96kHz sampling rate is more than twice the 44,100 (44kHz) sampling rate used on standard CDs. The numerical value assigned at 96kHz - about every 10.4 microseconds - is stored as a 24 bit digital word. The significance of a 24 bit digital word is that there are 16.8 million different potential values for each 24 bit word. By contrast there are only 65,536 different potential values for a 16 bit word on a normal CD. The additional 8 bits on a DAD allows for over 16 million additional voltage values to represent the original analog signal. Further, 24 bit resolution offers 144dB of dynamic range from the softest to the loudest musical note. At 144 dB of dynamic range we greatly exceed even the dynamic range available on the world's finest analog tape machines. For the first time in history of digital audio, we can provide Master Tape Sound MTS. After the analog signal is encoded, the resulting 24 bit/96kHz digital data stream is stored on a large computer hard disk. The raw data is then transferred to a post production facility for "authoring" - a process that results in the creation of a digital tape called a DLT that is sent to the disc manufacturing plant. At the plant, the DLT is used to make a "glass master" which produces stampers that are used to injection mold DAD discs. In all, the process is quite a bit more involved than making CDs but is worth the extra effort when you hear what this technological wonder has to offer. 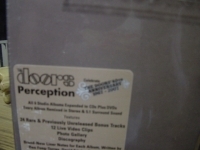 "The Doors, Perception - 6 CDs & 6 DVD Audio Box Set"